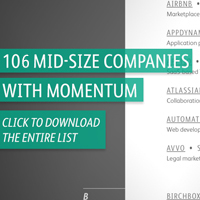 Each year we publish a list of rapidly growing mid-sized private technology companies. In our opinion, these companies are the ideal places for young people to start their careers. Our logic: Nothing early in your career is more important than achieving success — and nothing signals success more than working for a successful company (for a complete explanation of this logic please see 48 Hot Tech Companies To Build A Career). To qualify for our career-launching list a company must have revenues between $20 million and $300 million and be on a trajectory to grow at a rate in excess of 50% over at least the next three years. We built our list by surveying the partners of the following 11 venture capital firms: Accel Partners, Andreessen Horowitz, Benchmark Capital, DAG Ventures, Greylock Partners, Index Ventures, Kleiner Perkins Caufield & Byers, Matrix Partners, Redpoint Ventures, Sequoia Capital and the Social + Capital Partnership. We may have missed a few companies that qualify, but we doubt we missed more than a handful. This year our list includes 106 companies, up from 100 last year. 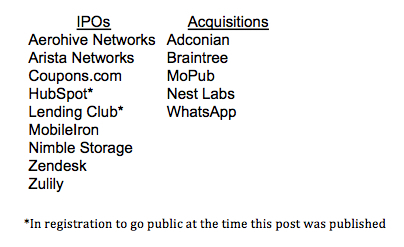 We added 33 new companies to the list; we deleted nine due to their IPO (we only include private companies), five were removed due to being acquired, one was dropped because it got too big (Gilt Group) and 12 because their growth slowed. As you can see we’re pretty good at identifying companies that are highly likely to succeed. Four of our companies will almost certainly graduate from our list next year due to our upper revenue boundary (Airbnb, Cloudera, Dropbox and Uber). One company, Snapchat, doesn’t really qualify on the revenue requirement, but they will blow past our minimum the minute they decide to turn on advertising, so we thought they were well worth including. As usual the vast majority (66%) of the companies are based in the San Francisco Bay Area. 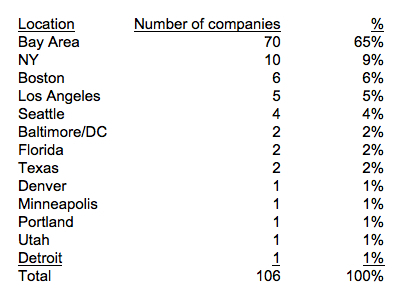 Interestingly, the majority of the Bay Area companies (70%) are now located in San Francisco, not the Silicon Valley. This trend has been underway for a while, but it’s interesting to see it in the statistics. New York and Boston are distant competitors to the Bay Area when it comes to hosting companies that are likely to become very large. The Bay Area maintained its share from last year while New York rose slightly and Seattle dropped slightly. Enterprise companies comprise 59% of the total, which is well in excess of the 41% represented by consumer companies. Consumer companies have the opportunity to build much greater ultimate value, but their odds of succeeding are much lower. Only five of the Bay Area consumer-focused companies are not headquartered in San Francisco. People who want to work on the Peninsula may need to look for slightly earlier stage companies. Only three companies offer hardware as part of their solution. This is amazing when you consider that semiconductor and hardware companies created Silicon Valley. We hope you find the list useful, but it really needs to be considered with the advice we provide in our Silicon Valley Career Guide. EDITOR’S NOTE: We amended the list on Oct. 8, reducing it by one; we regretfully overlooked Adconian’s acquisition in June. We apologize for the error. The information contained on the page and in the accompanying list and linked eBook is provided for general informational purposes, and should not be construed as investment advice. Wealthfront makes no representations or warranties about the accuracy or completeness of the information contained on this page or in the accompanying eBook or list. Nothing on this page or in the accompanying eBook or list should be construed as a solicitation or offer, or recommendation, to buy or sell any security. Financial advisory services are only provided to investors who become Wealthfront clients. Past performance is no guarantee of future results.